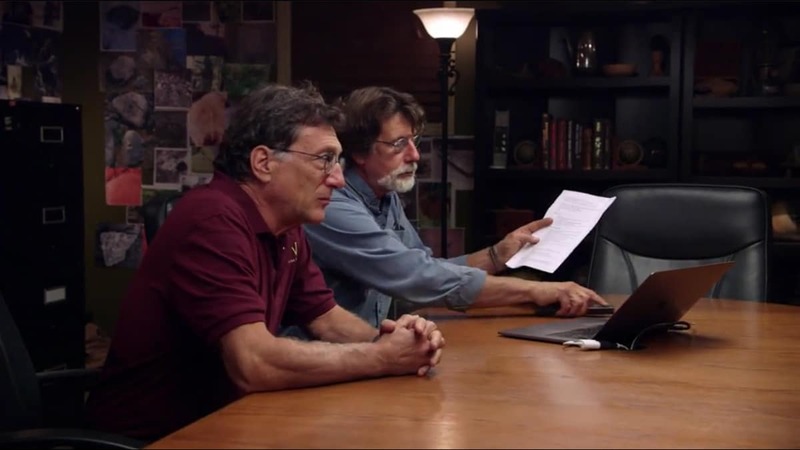 On The Curse of Oak Island this week the treasure hunting team are under the gun to get their work done before the weather and time curtail access for another year. 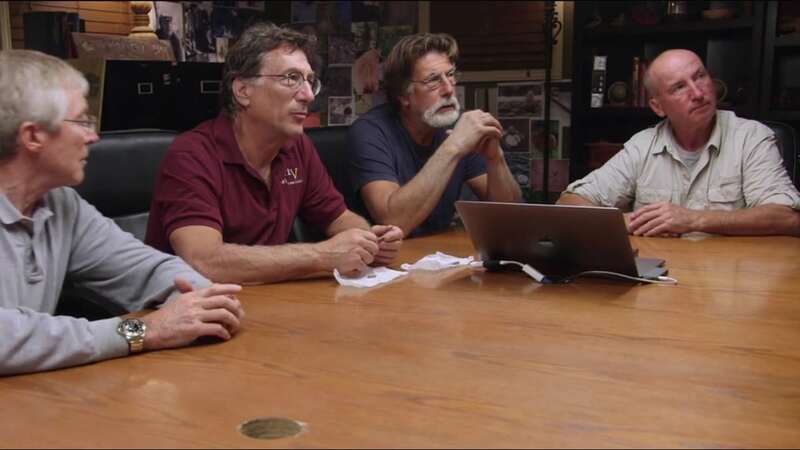 In the war room, Rick and Marty Lagina along with Craig Tester discuss their plans for Smith’s Cove with an added sense of urgency. They have secured an extension to work on the cofferdam and must decide how to proceed in light of the results of the recent red dye test. The test was designed to locate underground flood tunnels and Smith’s Cove was the only spot where the red dye emerged. The men concur that they need to follow up on this occurrence, but how? They agree to take apart the 6,000 square foot crane pad from below which the dye appeared. Marty notes the team is “absolutely running out of time,” and also remarks that the usually indefatigable Rick is tired. Rick doesn’t argue the point. At the Money Pit area, the S6 exploration continues. Vanessa Lucido of ROC Equipment tells the team that there is nothing new to report, while geologist Terry Matheson relays that the wood and rock previously found at the 101 feet level could have come from the 1861 Shaft 6 which directly connects to the Money Pit shaft. The most significant discovery was a piece of hand-cut oak timber, the kind that was reportedly used to construct the Money Pit. In light of this news, Rick tells the team to take any new material to the wash plant, a large scale sorting plant near Smith’s Cove. At the wash plant, crane operator Billy Gerhardt informs Rick that he’s found a possible pipe stem, pottery, and bits of glass amongst the Shaft 6 spoils. Rick thinks these finds speak to the fact that humans were in the shaft or in a tunnel associated with the Money Pit. Later Rick shows these odds and ends to other team members who think that the pottery is similar to that found in borehole H8 located a mere ten feet away, where evidence of what was believed to be a purported vault was also found. Do these latest finds indicate that the Money Pit is close at hand? When archaeologist Laird Nevin examines the Shaft 6 pieces, he renders a verdict that isn’t exactly enthralling. Peering at one of the pottery shards he notes it has a Blue Willow pattern, one used for a number of years, roughly 1810s-1840s. Next Laird examines a piece of red-bodied stoneware. He has not seen the striations on it before, meaning it could date earlier than the other finds, possibly to the early part of the 1700s. “This is the sort of thing you’re hoping for,” he says. Could this stoneware bit be definitive proof of human activity in the area, prior to the Money Pit, circa 1795? Rick is hopeful, stating that, “it’s the first real a-ha moment,” for Laird. Later that evening Rick is called to Shaft 6 for a meeting that could not wait for daylight. Geologist Terry Matheson informs him that most of what has been brought to the surface is limestone sediment fairly common to the area and not unexpected. At the current depth of 190 feet, this is a disappointing development. It means that the can has gone well below the presumed debris field where valuable clues or objects might have been found. Rick sums up the news by saying, “I strongly advocate that we end the hole,” and move on to a new location. 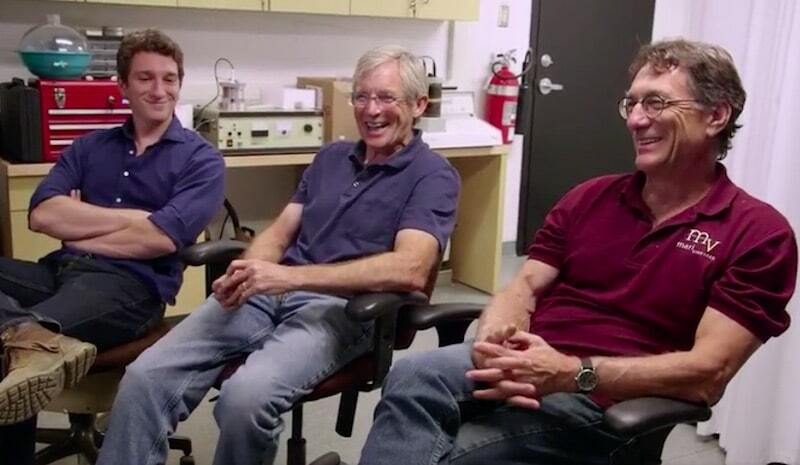 In the research center, historians Doug Crowell and Paul Troutman join Rick to discuss the best site for the new borehole. 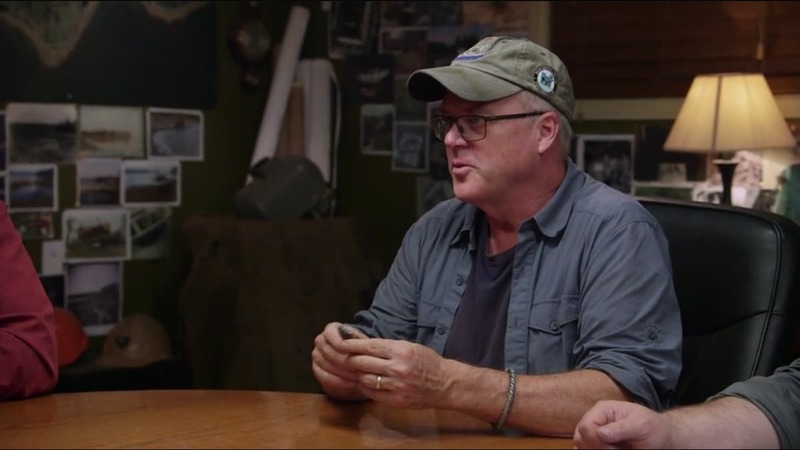 Rick asks Paul where he would choose to sink the next can and he points to a location on Steve Guptill’s virtual master map of holes previously dug on Oak Island. Later Steve Guptill joins the crew in the vicinity of where the new exploratory borehole will be sunk in order to help pinpoint a prime location. “We may find the Chappell Vault, we may find the Money Pit,” says Rick. He then asks Vanessa to name the site for posterity, suggesting she name it after her daughter, Gracie. She decides upon “G.G. 1,” in honor of her child and appears touched by the gesture. Meanwhile, metal detecting expert Gary Drayton and team member Jack Begley scour Lot 21, previously owned by searcher Daniel McGinnis. Is it possible he could have left behind Money Pit artifacts discovered centuries ago? “Cmon, something good!” Jack yells when the detector beeps. “Woo-woo!” cries Gary as he pulls a piece of lead out of the ground. There is a decorative design along the edge. When Gary puts the second find next to the first he says they fit together like a glove, with a square hole smack dab in the middle. This discovery reminds him of the hole in the lead cross discovered a year ago at Smith’s Cove which dates to before the 15th century, and is possibly connected to the Knights Templar. “This might be holey-schmoley, Part II,” he exclaims and the men celebrate with a high-five. Gary later tells the others that he believes the find is, “really, really old.” Laird notices what could be decorative vines on the piece which may be symbolic of the Holy Land, or even the Tree of Life. Adding to the excitement is the fact that, while on an expedition one year ago in Domme, France, the team found what may have been Knights Templar carvings, including one of the Tree of Life, as well as a carving very similar to the lead cross found on the island. The similarities all around are enough that the team calls again upon Tobias Skowronek to use laser ablation to date Gary and Jack’s find. The hope is that the two newest metal bits are indeed related to the lead cross. “If there’s a piece of metal you’ll find it,” replies Marty. When Tobias tells the team assembled in the war room that the results, “could be a little bit different from your expectations,” the silence in the room is deafening. He thinks that the find could have been an art object, as it shows evidence of cloisonné, a decorative technique that dates as far back as 13 B.C. But the real shocker drops when he reveals that the lead isotopes in the find are identical to those of the lead cross. “Really? Wow,” says Rick with tremendous understatement. Tobias confirms that the lead cross and the latest objects probably came from the same ore deposit, dating to pre-15th century. At this point, grins break out all around the table as the incredible news sinks in. Tobias has just confirmed that all of the lead items he has tested for the team were likely mined in an area of southern France that has ties to the Knights Templar. Could the items that Tobias asserts are from the same ancient mine in France validate a Knights Templar connection to Oak Island? If so, this could be one of the greatest breakthroughs in the 223-year search for treasure on Oak Island. In addition to possibly finding priceless artifacts underground, the team could now be on the verge of rewriting North American history! 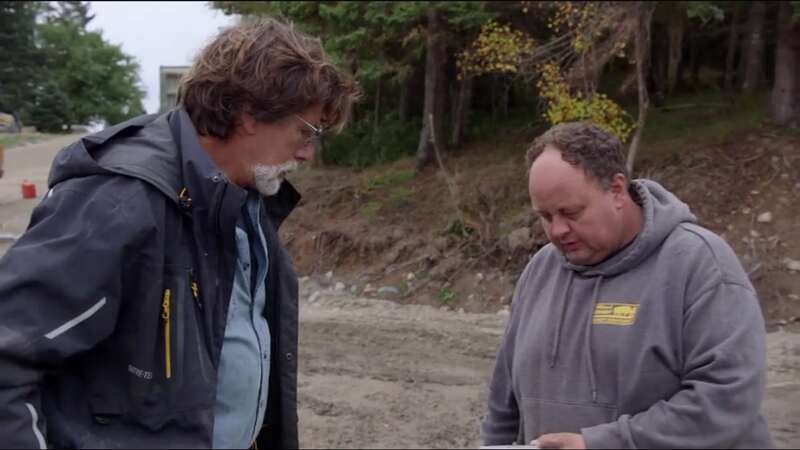 The Curse of Oak Island: Who was treasure hunter Robert Restall?